Meet Me in the Bar: Classic Drinks from America’s Historic Hotels, by Thomas Connors, is a travel guide for the cocktail tourist. The book lovingly describes a couple dozen or so grand, old hotel bars, along with signature drinks concocted therein. Representing Boston are the Oak Bar at the Fairmont Copley Plaza and the bar at the Ritz-Carlton. 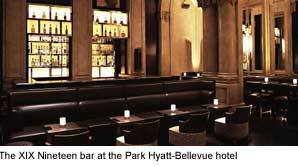 Philadelphia, where we spent a recent weekend, has the Library Lounge in the Park Hyatt at the Bellevue. Or at least it did in 2003, when Meet Me in the Bar was published. We should’ve called first. Ironically, Connors writes of the Library Lounge, “These days, as hotel operators jazz up old properties for a younger clientele, it’s possible to walk into a sober-looking hotel and discover that that sensible bar you once knew is now a scene. Luckily, the 19th-floor Library Lounge is nothing like that.” He goes on to describe its intimate scale, its rich woodwork, its fireplace and its book-lined walls. Sigh. That would have been great. The brand new bar that we found in its place, XIX (aka Nineteen), has most decidely been “jazzed up for a younger scene.” The only thing that remains from the Library Lounge is a large painted portrait of a well-to-do Quaker ice skating. XIX is a posh but beige bar that could be in any first-class hotel in America. Sure, it’s a nice, polished-marble oasis high above the city, and the bartender was a welcoming and competent guy who had just moved up from Baltimore. But he had never heard of a Clover Club. That drink — gin with egg white, lime, raspberry syrup and bitters — originated at the Bellevue, and Connors calls it “the spiritous equivalent of the famous Philly cheese steak.” Unfortunately, the Clover Club seems to have gone the way of the books that once lined the walls of this bar. Vodka is now the dominant spirit on the cocktail menu, as it is in every other posh hotel bar in the country. At least they had Yuengling Lager. One would wish to hear a sentient explanation of the benefit, if any, of replacing the Library Lounge with XIX. The Library Lounge was not replaced by a drinker, not by a greenhorn youngster, but by a designer of some sort. So it goes. Try the Vesper Club.